Want to try out Costco without committing to a membership? You can at Costco Moorabbin on Tuesday 28 November. This one off event is for local families to try out Costco for a day. Costco is a membership based warehouse and usually if you aren't a member of Costco, you can only receive an access pass to browse but not buy. This time it's different. From 10am, you have the option of browsing and buying for the day. The "VIP Shopping Experience" also includes a tour of the warehouse if you wish and light refreshments. This one-off event is open to local Mums. Simply go to the Costco counter on entrance and complete the registration process. 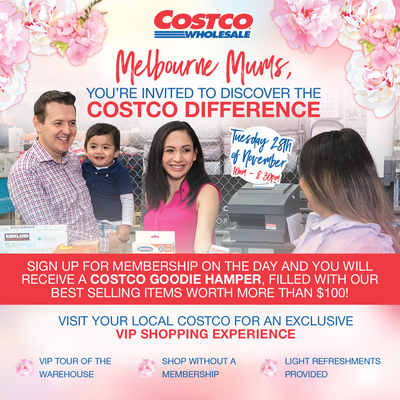 If you do decide to sign up for membership on the day, you will also receive a Costco goodie hamper filled with best selling items valued at more than $100.